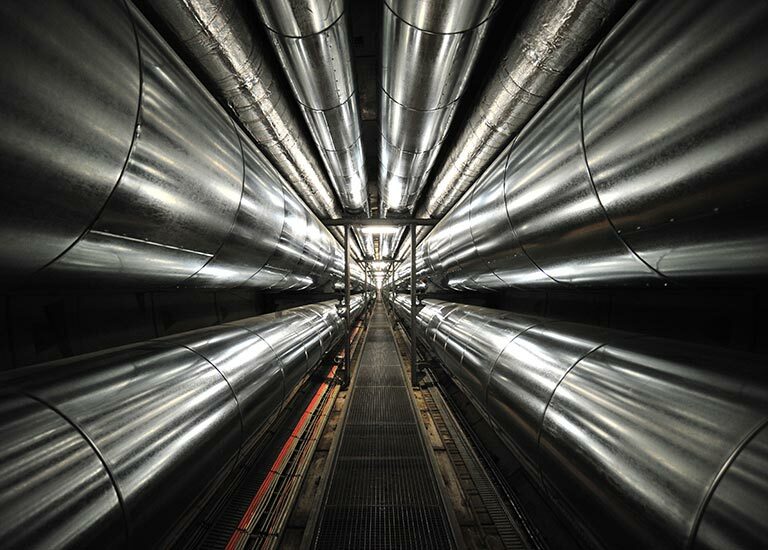 District heating systems provide economies of scale in large cities like Copenhagen. Photo: Bill Ebbesen. License: CC BY 3.0. The scale of the issue: HVAC is responsible for more than a third of energy use in commercial buildings in the U.S. The human impact: Discomfort from spaces that are too hot or too cold, and lack of adequate ventilation, are an epidemic. Good design that fixes these problems supports healthier, more productive occupants. Don’t make the all-too-common mistake of thinking of HVAC design separately from building envelope design. Over-glazed buildings lead to oversized mechanical systems, increasing costs on both fronts. A tight, well-insulated envelope may cost a bit more but can pay for itself with less mechanical equipment. Roofing choices are complicated by heating tradeoffs, climate effects, and condensation, but proponents say reflective roofs still make sense in most climates. Using the sun for most of a building's heating needs is in the DNA of green building. But in an age of superinsulation, does it still make sense? By creating heat instead of electricity, solar thermal achieves three times the efficiency of photovoltaics at a lower price. Ductless split systems using heat pumps and variable refrigerant flow offer an energy-efficient alternative to conventional heating and air-conditioning systems for a variety of settings, from homes to hotels and schools. Three major manufacturers-Daikin, Mitsubishi, and Sanyo-offer the greatest variety of products. Greenhouse gas emissions associated with residential energy use account for a fifth of all emissions in the U.S. Retrofitting existing houses to achieve a two- to three-fold reduction in energy use is necessary if we are to achieve the emissions reductions scientists say are required for avoiding catastrophic climate change. Here's a look at how it can be done. Build Equinox and Minotair Ventilation Inc. (MVI) have updated their heat-pump-based energy recovery ventilation systems, providing better control of humidity, heating, and cooling in a smaller footprint.